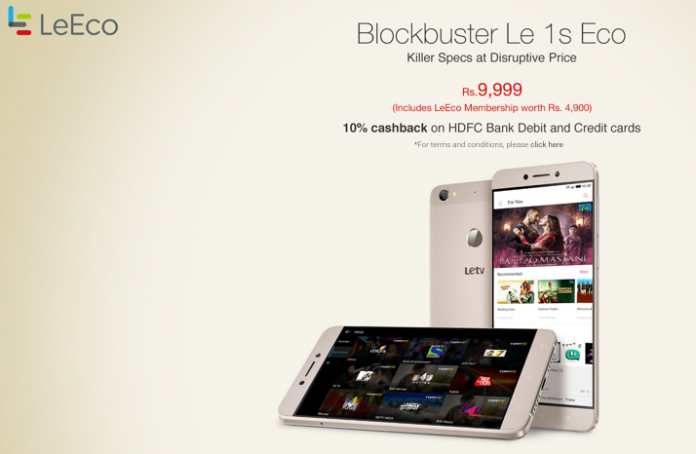 LeECo’s Smartphone Le 1s is on Flash Sale of 100000 units in india today online on Flipkart. The sale would be only for those who registered for the same. The registrations which had started on 3rd may 2016 would be ended at 1pm today. The Flash sale would be commencing from 2’o clock this afternoon. The Chinese company LeEco had created ripples in the tech industry with the launch of its smartphone. Having featured with new and top most features for a unparalleled cost makes this phone a hot favourite for many people. The blockbuster phone has already received stupendous response from users with a record registration of 1 lakh on Flipkart within a day. The company is giving users this huge bundled membership program Worthing Rs. 4,999/- absolutely free. The LeEco membership program includes features like 100+ TV channels, 2000+ movies,*3.5 + million songs along with 5 TB cloud personal storage space valid for one complete year. The phone comes with a 5.5- inch full HD (1920X1080P) display with Gorilla Glass 3 protection. Android 5.0 Lollipop based phone is powered by a 1.85 GHz octa- core Hello X10 MediaTek Processor with 3GB of RAM. 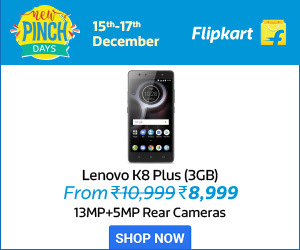 Regarding camera quality, the device offers a 13MP rear camera with LED shooter flash and 5MP front camera for selfies. The phone comes up with 32GB of internal memory. You can buy the LeEco Le 1s Eco today starting at 14:00:00. Make sure to login a few minutes prior to the sale to beat the rush. Don’t wait for long! 1. Go to the LeEco Le 1s Eco page by clicking here. 2. You can buy the LeEco Le 1s Eco at 14:00:00 by clicking on the BUY button. 3. Your LeEco Le 1s Eco will be added to the cart. 4. After adding it to cart, you will have exactly 4 hours to complete your purchase. Only one LeEco Le 1s Eco per customer. First come, first serve! Extra 10% CashBack on HDFC Bank Credit and Debit Cards! Go book yours now. Hurry!